Organic papaya ripened in the Spanish sun. 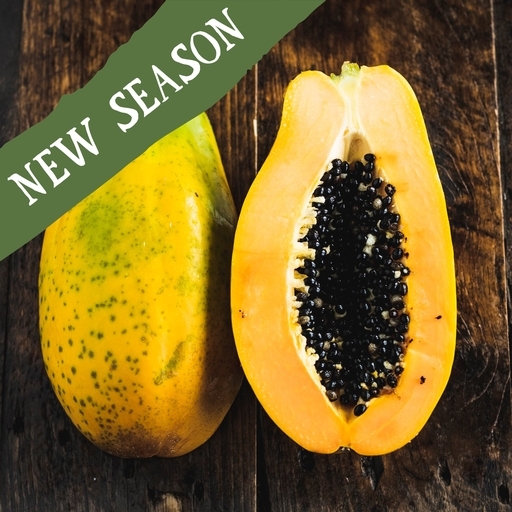 Papaya’s sweet, fragrant taste will be familiar to most people as the central note (alongside mango) in just about every ‘tropical flavour’ childhood treat. A single spoonful transports you instantly to somewhere exotic. For an Asian-style salsa, use your papaya while it’s still slightly under-ripe, with plenty of chilli and salt to balance its perfumed sweetness. Otherwise, wait until perfectly ripe, then eat as is, blend into smoothies, or make a sublime fruit salad with banana, mango, a drizzle of honey and a squeeze of lime. Store in a fruit bowl until ripe, then move to the fridge. Grown in Spain by Paco Lozano and his team. Paco has been working with Riverford for 10 years, growing our tomatoes and Romano peppers outside of the UK season, plus aubergines, melons, and other crops that struggle in our cooler climate.